Kidz Katch is a new gadget every parent with a self-feeding baby needs! This post is sponsored by Kidz Katch. All opinions are my own. First off, can I just say it took every ounce of my being to not spell clean with a K to make my title catchier. It really did! But, SEO told me not to. Anyway, Kim from Kidz Katch reached out to me and told me about the product she had just created. I was so excited to see a mom launching her business and going after her dreams! Also, her product fit my needs perfectly: I have a 14 month old self-feeding baby. That means I have food being thrown on the floor constantly. CONSTANTLY. When Otto decides he's done, he "tells" me by throwing the remainder of his food on the floor. He also misses his mouth or accidentally drops food too. Meal times are messy with self-feeding babies, but that's where Kidz Katch comes in to keep your floors clean. After Henry was born, we managed to still go out to eat at least once a week. We took him everywhere with us! He was a chill and content baby and was easy to take places. Plus, if on the rare occasion he did become a handful, one of us could still eat while the other one managed him. After Otto was born, we went out a few times and quickly learned that going out with two children is completely different than one. Like, a whole different level. 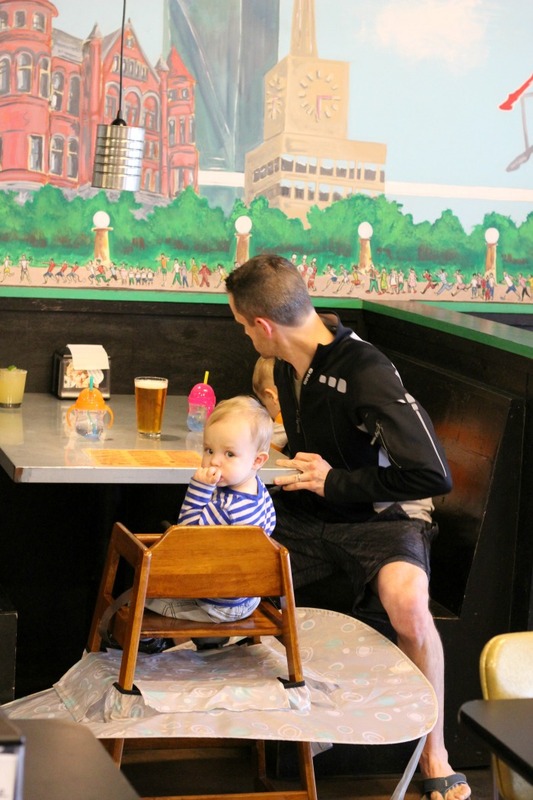 My husband would manage Henry, who by this time wanted to spend his time walking around and exploring the restaurant while I stayed with Otto, trying to balance a bottle in his mouth while I attempted to eat my food before it got cold. In those early months with Otto, it just wasn't worth going out. I don't even think my husband and I talked; we just jockeyed the kids. Enter the phase of our lives where we became take out pros. There was a solid eight to ten months when we never, ever went out; we would only order and bring it back to our home. That's a sad way to live, trust me! 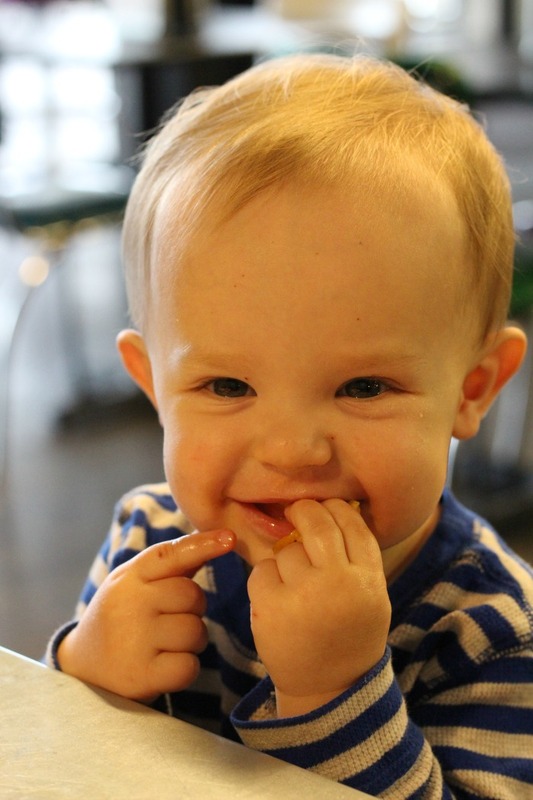 Now that Otto is 14 months old, eating solid foods on his own and is walking, we've started to venture out again. And good news! It's fun again. Still not as easy as taking one kid out, but both boy's are fairly self sufficient, at least enough so that hubs and I can eat our food and maybe even have a conversation. This adorable face has kept us home bound for too many months - time to break free! What isn't fun is the mess we leave behind when we go out. Now, we only go to kid friendly places but still! It's like a beach of food bits where ever the boys have sat. We're mindful of how they behave but that doesn't stop the stray tator tot from falling, or a bit of grilled cheese from not making it into a mouth. Kidz Katch works amazingly to "katch" all those flying food bits. It fits in my purse and then easily unfolds, slides onto the high chair (yes, even the ones they have at restaurants!). I had this thing on Otto's chair in less than 30 seconds. Plus the inside Velcros to the outer ring so that there is no exposed place for food to fall onto the floor from. It covers all your child's messy eating bases! 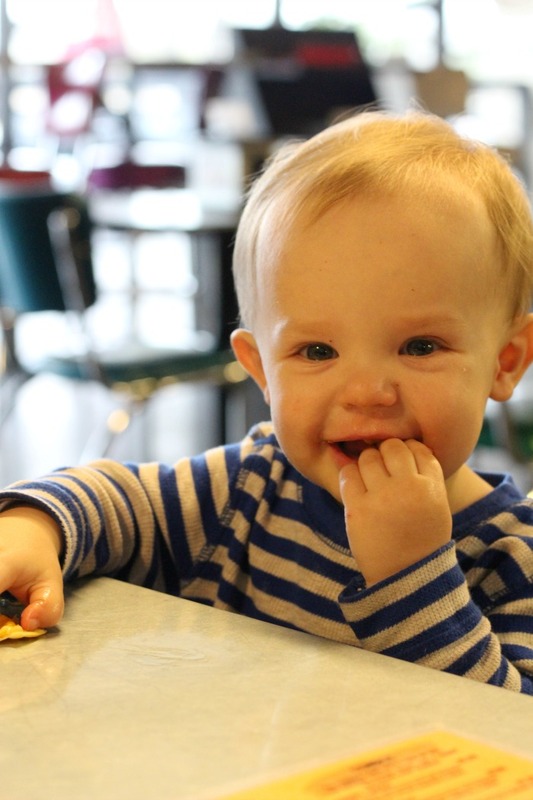 We took it to our favorite taco shop after a yoga class, and Otto was able to enjoy his quesadilla in full force. And when we left, the wait staff wasn't glaring at us for how big of a mess was made! I just wiped it down with a napkin and threw away the food bits that dropped, then folded it back up and put it in my purse. It made going out to eat easy, fun, and mess free. 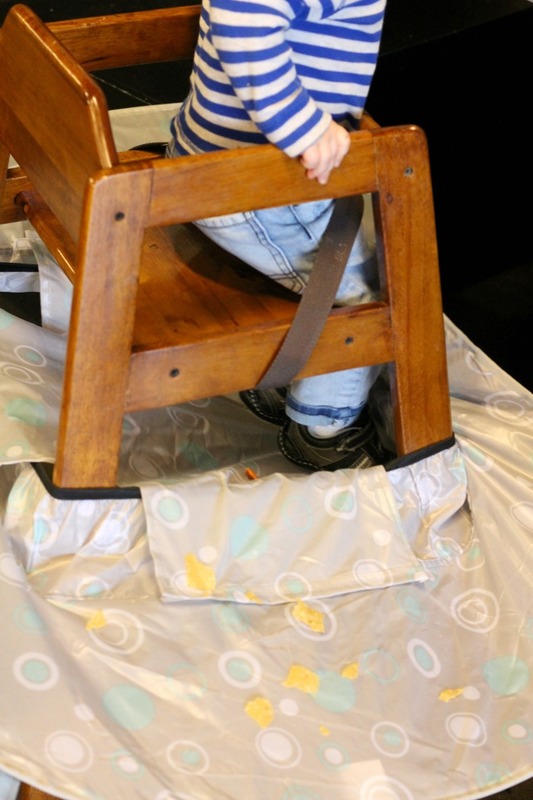 This will work on your high chairs at home too. It's so easy to take on and off, and folds up small enough for a drawer or can be put in a purse like I did to bring it to the restaurant with us. The waterproof material is easy to wipe down or to spray with a cleaner. It's so much easier cleaning up after a meal - I can take it to the sink and dump it down the garbage disposal as opposed to getting on my hands and knees and wiping up the floor. Kids change everything. Including how and where you eat your meals! 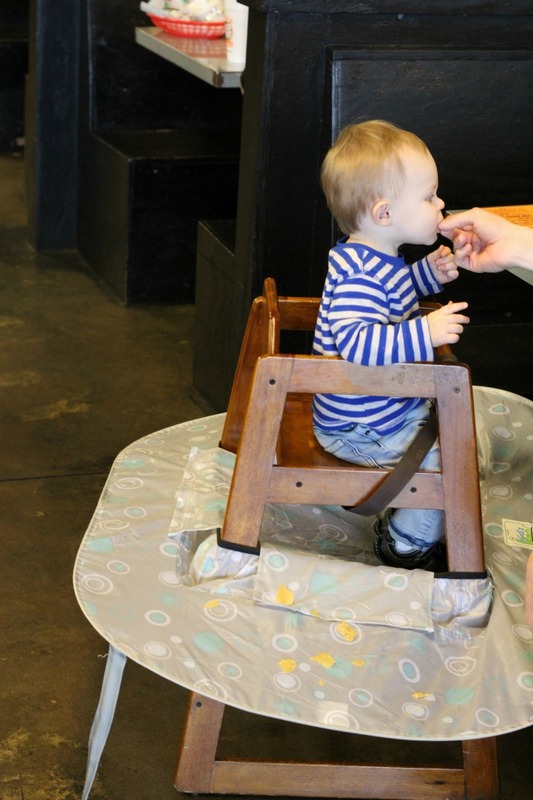 Babies can make a massive mess, and it's especially challenging (and embarrassing) at a restaurant, even kid friendly ones. 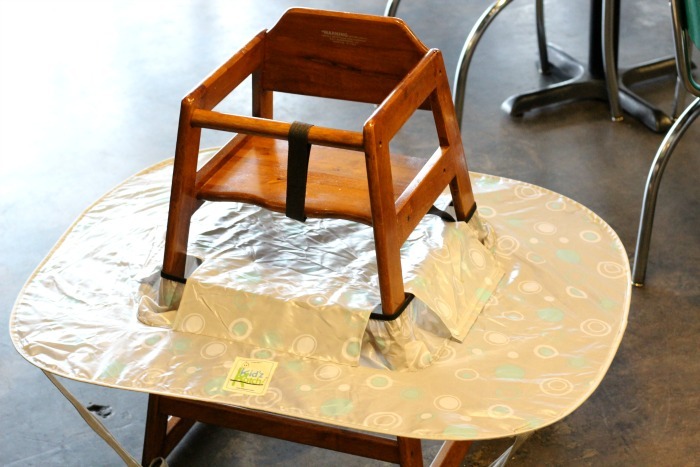 Make life easier on yourself and tote along one of these Kids Katch food-catchers to keep your floors clean and messes contained. Whoa. That thing sounds amazing. Do they make a grown up version? Well this is pretty cool! We haven't gotten to the phase where EJ throws all his food on the floor, but he's definitely started throwing a few things down when he's done eating. I can totally see the wait staff loving you for this! Never seen anything like this before. Certainly didn't have anything like this when I was raising kids. Very useful. What a cutie your Otto is! Ohhhh how my one year old loves to throw his food on the floor. I could use one of these. What a fantastic idea. My son has an 14 month old and this would be perfect for him. Impressed by the administration as well as cleaners from LCS cleaners Northampton. These people make use of a grin and truly appreciate their work. Pleasant experience speaking with work and also the cleaners are very open with any instructions I've! I'm good everyone have a great experience.